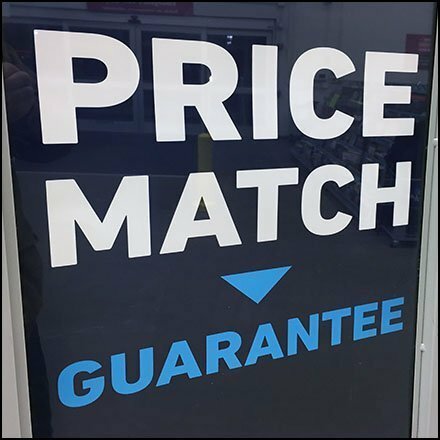 Far better than a “Welcome” or “How Do You Do” is this Price Match Guarantee Entry Sign Assurances. Now you can shop with confidence and even buy today, without going home and being stricken with buyers regret over spying a better price. A lower price will be matched. But come to think of it, better check the five lines of fine print at the bottom of the sign for conditions … both pro- and retroactively. But consider the enthusiastic promo itself in the gallery of slideshow images. This Assurance seen at Lowes.